Published Bestsellers: Author of OTOLI, Bryony Allen has been busy judging the winning entries for a writing competition. 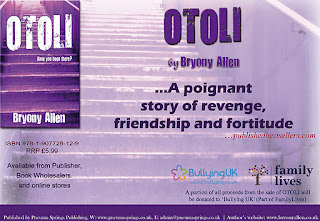 Author of OTOLI, Bryony Allen has been busy judging the winning entries for a writing competition. Movellas recently launched a writing competition themed around ‘Bullying’ and titled “Both Sides of the Story”, with Bryony Allen's book OTOLI as the stimulus for the competition. The competition is now over and Bryony Allen was selected to judge the winning entries. Well-done Bryony!